Please join us in welcoming Roger Brown to the sales team at Runde Chevrolet in East Dubuque! Roger, who was born and raised in Dubuque, has been working in automotive sales for 12 years. He enjoys seeing all the new technology in vehicles and has gotten to be a part of the automotive industry’s shift toward the internet. At RundeAutoGroup.com, you can fill out an online trade evaluation, online credit application, calculate payments, and shop more than 1,600 vehicles 24/7. You can also chat with our salespeople (like Roger!) who can answer any questions you may have. 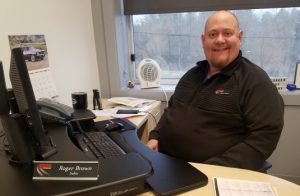 Roger now lives in Boscobel, Wisconsin, with his wife, Lori, twin stepdaughters Amelia and Bailie, and their two cats and dog. He is active in his community and has served as an Elected Alderperson on Boscobel’s City Council since 2008. In his spare time, he enjoys watching the twins compete in high school sports. His favorite vehicle is the Chevrolet Bolt. “I see the future in electric vehicles and the Bolt has been a really great example of what General Motors’ future looks like,” he said. Roger is looking forward to selling from Runde Auto Group’s inventory of over 1,600 vehicles and providing a no-pressure buying experience. Roger can be reached by calling (866)-735-5200 or emailing rbrown@rundeautogroup.com.